How Can I Remove Dried Algae Without Damaging the Paint? from the bottom of a painted fiberglass boat without damaging the hull or bottom paint? I assume that your are referring to anti-fouling or bottom paint and not a hard finish like Urethane. Because bottom paints tend to be soft, so they can leach their biocides, all chemical bottom cleaners, which are acid based, will attack the paint to some degree. The other alternative is to use abrasion (sanding or scraping) but this will also remove some of the paint. Either way, you will cause some damage to the paint and will have to refinish it, or strip it off completely and use an alternative way of protecting your bottom, like VS721 Bottom Coat. There are numerous formulations for Bottom Cleaners. Some are more aggressive than others and are intended for different uses. 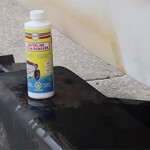 Cleaners like Algae Strip and Waterline Stain Remover are intended for bare fiberglass. One is designed for removing heavy growth and the other for removing stains. They are quite aggressive and have great penetrating power. That allows them to get into the pores of the fiberglass and remove the microscopic algae, etc., which can result in staining. Algex is designed for removing marine growth from Aluminum and many boat owners have reported good success in cleaning hard painted boats and painted wooden boats with no, or a minimum of, damage to the paint. It is also an acid based cleaner but uses a different combination of acids, which are less aggressive. You can also use this specialty cleaner for cleaning metal shafts, struts, trim tabs, lower units and propellers. None of these three bottom cleaners will damage fiberglass. If you have growth on your bottom, your bottom paint is no longer effective. You will have to be replace it anyway, so your choice of bottom cleaner is not so critical. You should still try it on an inconspicuous spot to determine if it gives you the results that you will be happy with, before you do the whole boat. Be sure to read and follow the directions on the back of the bottle. You will be using some powerful cleaners and it’s important to work safely. Click on the links to get more information on each product so you can make an informed buying decision.